We enjoy creating a friendly, engaging and comfortable environment for all of the residents of Marin Convalescent Hospital. From 10 am – 4 pm we host activities personalized for our residents’ needs and abilities. We hold many holiday BBQ’s throughout the year. Residents, staff, family members and friends are all invited. We are grateful to the many outside groups and entertainers that bring us weekly, monthly and bi-annual performances. Wings of Song is a Marin-based Women’s Choir with 30 members that brings wonderful Spring & Winter Concerts that consistently delight our audiences. Monthly Performances of music, dance, puppets and more are sponsored by Bread and Roses. 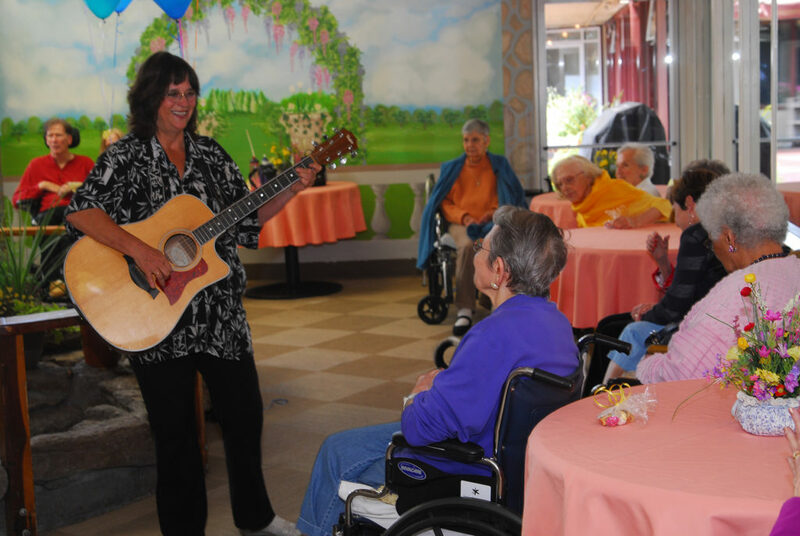 A musician performs live every Friday afternoon at 3:30 and sometimes residents dance to the music. If a resident has special interests or a hobby like painting or reading, we will make efforts to accommodate these needs. Televised sporting events of particular interest to Bay Area residents are promoted to residents as well. Every month we hold a big birthday party for residents. Again, staff, family and friends can attend. Resident and staff birthdays are also listed on the monthly calendar so staff and residents can acknowledge them. Our Resident Council Group chooses an outing for the upcoming month. Transportation is provided by our company vehicle and Whistle Stop (a local paratransit service). Families can and do come along. The destination is usually a restaurant or a local park for a picnic. Each week typically has 2-5 theme days. At Marin Convalescent Hospital we have a private room with an exhilarating view that you can reserve for a family dinner, birthday party, meeting or professional conference, etc.